As wolves return to France, wolf-human conflict abounds due to agriculture, attitudes, and ancient history. Before we consider that conflict though, let's look at the wolves' return to France from the animals' point of view. In 1992 wolves dispersed from crowded Italy (512 people per square mile) to less-crowded France (289 people per square mile). They soon denned in France's Mercantour National Park, near the Italian border. In terms of prey, the predators chose well. That park is home to chamois (a goat-antelope species), red deer (elk), roe deer, and wild boar. In terms of proximity to humans, though, the choice was not so good. Mercantour's 170,000 acres contain 28 villages along with uninhabited areas. Given that these are mountain villages, sheep are everywhere. The wolves noticed: eighty percent of all wolf attacks on livestock have occurred in this part of France. Though this is one of the country's least densely populated areas, the villagers reacted with such venom that a wolf hunt - of a nationally protected animal - was allowed. However, in late 2013 a French court struck down the hunt. Meanwhile, the wolves did what comes naturally and continued dispersing. From Mercantour they headed west, surmounting two major barriers, the Rhone River and the A75 autoroute, a high-speed, multi-lane freeway. They took up residence in the Massif Central, a rugged region of mountains and plateaus that covers about a sixth of France. Like some other parts of Europe, the Massif Central has lost population as rural residents have departed for opportunities in cities. This exodus expanded available wolf country, but producers of cattle and sheep remain. And that means conflict. By 2012 wolves had dispersed as far west as the Gers region, another lightly populated area. And one that survives on agriculture. Wolves have also appeared north of Mercantour. By 2011 they had arrived in the Vosges Mountains of northeastern France. At first glance this looks like a good choice: The region contains two national parks and is described as one of the most rural areas in all of western Europe. But Paris is only a few hundred miles to the west, and for some reason that's the direction wolves have headed. In January of 2014, a wolf was killed just 99 miles from Paris. Nine months later, wolves were seen in forests within 40 miles of Paris, according to The Telegraph, a UK newspaper. Even though wolves returned to areas lightly populated by humans, as the wolf count has increased to about 250 animals, so has conflict. The battle lines are similar to those in other countries. When wolves are accused of attacking sheep, the agricultural lobby calls for wolf annihilation. Environmental groups counter that wolves belong in France and farmers must learn to coexist. And the rural versus urban divide also exists. In 2013 in the house of the French parliament where wolf-heavy rural regions are represented, one senator blasted urban Parisians for what he saw as their unrealistic image of the predator. According to The Local, a news website, he said that the time had come to release wolves in the largest public park in Paris. His suggestion was not adopted. The senator was trying to stoke wolf hatred with an old French fear. In the mid-1400s, a pack of wolves did sneak into wintertime Paris and kill 40 Parisians. Citizens were so furious that they rounded up the wolves and stoned and speared them to death near Notre Dame Cathedral. That is not the only incidence of wolves attacking humans, according to a French Historian, Jean-Marc Moriceau. His 2010 journal article, "A Problem of Rural Environment: The Danger of the Wolf in France from the Middle Ages to the Twentieth Century," contains a map which shows a total of 5,379 reported wolf-related human casualties from 1400 to 1918. His findings were contested by some French conservation groups and a debate ensued. When asked about such attacks, the well-respected Italian wolf biologist, Luigi Boitani, told an interviewer for Spiegel Online: "Of course, wolves killed people in the past. But that was before we had firearms. Wolves have learned that people can also be dangerous when they're far way, which is why they normally make a wide berth around us." Though returning wolves have not attacked any humans, wolf hatred is ingrained in the French culture, and hate-based killing has decimated wolves. In 1800, 5,000 wolves roamed the French countryside. Between 1818 and 1829, about 1,400 wolves were killed per year as the use of firearms became more widespread. By 1900 the French had added strychnine to their arsenal and reduced the wolf count to 500. By 1937, wolves were extinct in France. Luckily, wolves were never killed off in neighboring Italy, and in 1992 Italian dispersers entered France's Mercantour National Park. 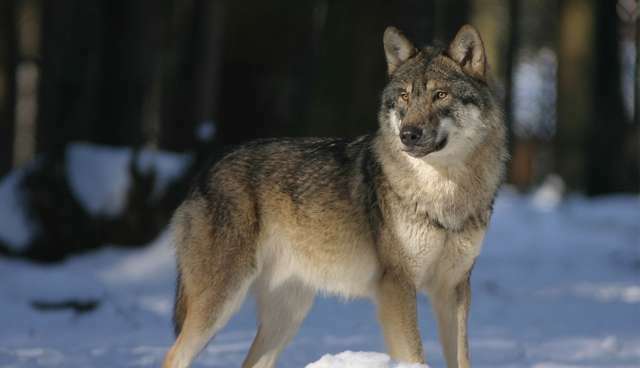 The Local reported that about ninety percent of France's 250 wolves now live in or near the park and near grazing sheep. Wolf-human conflict erupts each time wolves attack sheep. Sheep producers are not without recourse and assistance. As Boitani pointed out in his interview, "In Spain, France and Italy, for example, the European Commission has paid for hundreds of livestock guardian dogs, electric fences and the construction of small huts where the shepherds can sleep." France's government spent more than $13 million in 2013 preventing wolf attacks and compensating farmers, according to the UK's Sunday Times. In addition to shelling out money, the government holds another card. Though the wolf is protected by French and European law, government marksmen can kill up to 24 French wolves each year. To deal with all this wolf-human conflict, France has written a national wolf plan. The plan covers four years (2013 to 2017 is the most recent) and includes monitoring wolves, compensating for wolf damage, and supporting farmers. The plan's main objective: to protect wolves while limiting their impact on livestock. This won't be any easier in France than it is in the US. In October of 2013, in a small town just over two hours' drive east of Paris, a wolf or wolves attacked sheep. The farmer who lost one ewe and had 17 others injured told The Independent that his sheep had been attacked three times in the last six months, and that wolves should be shot on sight. For the same report, The Independent interviewed Pierre Athanaze, the president of a wildlife defense group, ASPAS. He projects that the wolves recolonizing France from Italy will soon join the wolves recolonizing Germany from Poland. He believes that French sheep farmers are just not accepting the reality that wolves have come to stay. He also believes that farmers are out of step with France's population as a whole. His organization recently commissioned a poll which found that 80 percent of the French people want wolves to be protected from farmers, instead of protecting sheep from wolves. For wolves to survive in France, these essential predators will need every bit of protection the law, conservation organizations, and concerned French citizens can provide.